SANTA FE, NEW MEXICO (ANS – August 19, 2015) — From capital to capital, Santa Fe, New Mexico is 4,931 miles away from London, England. On an airplane the time to get from one place to the other is roughly 10 hours. On land and boat, too long to consider! But when music is the source of travel—the time between the two is shortened, almost timeless. 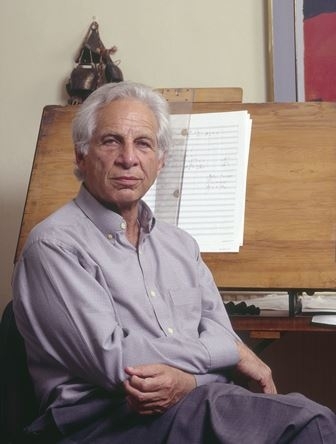 The Santa Fe Chamber Music Festival embarked on a timeless journey, using Alexander Goehr’s World Premier piece, 7 Impromptus for two pianos, Op. 96, as the mode of travel. As a festival commission supported in part by a grant from the Brown Foundation, 7 Impromptus was written in 2015. In it’s world premier it was performed by pianists Ran Dank and Soyeon Kate Lee. To say the evening was engaging would be an understatement. 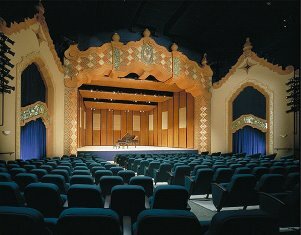 The confluence of a marvelous composition with masterful musicianship showcased in the beautiful Lensic Theater in the historic district of Santa Fe was feast for the senses. German-born, English composer, Goehr (b. 1932), studied at the Royal Manchester College of Music and later in Paris with esteemed composer Olivier Messiaen. His works range from opera and orchestral works to chamber and concertos. The BBC commissioned his recent orchestral work, When Adam Fell in 2012. Much of Goehr’s work incorporates avant-garde and modern tonalities. But things changed in 1976 with the release of Goehr’s Psalm IV, where he returned to traditional compositional styles—as least for a time. His music has been described as eclectic and structurally beautiful. The night in Santa Fe was no different. Seven Impromptus was both complex and inquisitive. At times the two pianists were intensively playful, debating in a call-and-response interaction; at other times they were sublime and angular. As I listened to Dank and Lee perform, the syncopation and geometrical music was cubist in form, dreamlike—but with a gradient, almost architectural. The pianists played with passion in a coupled independence. The piece was trans-harmonic and layered, incorporating space and density, and ending in a dissonant question. In all, Seven Impromptus had a strange, tilting-logical beauty. Sequiturs and non-sequiturs summarized the composition well. In formal logic a sequitur is an argument that does not follow from its premise; the conclusion can be either true or false. There is a disconnection in the syllogism. Seven Impromptus incorporated the geometrical and logical disconnect to great effect, an intellectual journey worth travelling—a discordant and vision-like voyage of the mind and emotions. In numbers III and V the notes should be half notes, instead of the quarter note shown. The note was unavailable on Word. 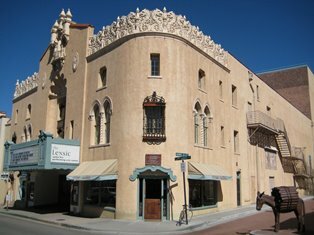 Photo captions: 1) Lensic Theater, Santa Fe, New Mexico, 2) Santa Fe Chamber Music Festival. 3) Lensic Hall. 4) Brian Nixon. About the writer: Brian Nixon is a writer, musician, and minister. He’s a graduate of California State University, Stanislaus (BA) and is a Fellow at Oxford Graduate School (D.Phil.). As a published author, editor, radio host, recording artist, and visual artist, Brian spends his free time with his three children and wife, painting, writing music, reading, and visiting art museums. 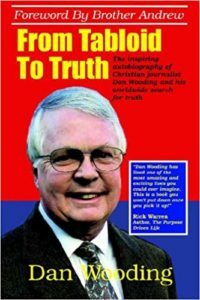 To learn more, click here: http://en.wikipedia.org/wiki/Brian_Nixon.